I read a review of Wired For Culture, by Mark Pagel, in the February 25, 2012 edition of The Wall Street Journal. The review, by Olivia Judson, also included a commentary on The Neighborhood Project, a new book by David Sloan Wilson. Though he doesn't use my nomenclature, it seems clear to me that Pagel's book analyzes some of the important consequences of the "two world hypothesis" that underlies most of my comments in this blog. 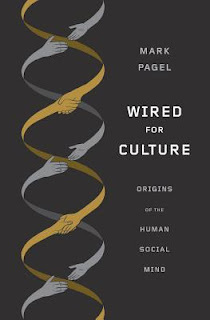 Specifically, Pagel finds that the "human world," the world that we create, is defined by and established within human culture (or cultures in the plural). He argues that "cultures form invisible structures - he calls them 'vehicles' - that humans reside in." Near the end of the review published in The Journal, in a commentary on Wilson's quite different book, Olivia Judson makes this point: "despite residing in our cultural vehicles we are, in a deep way, still a part of nature." I put it this way: Our human world, the world created by human action, the world of "culture," and the "vehicle" in which we most immediately reside, is deeply dependent on the world of Nature, a world we did not and do not create, and it is this world of Nature that ultimately sustains all life.